GUELPH, ON (June 26, 2013) – Today, Grain Farmers of Ontario and SeCan announced a new partnership to fund a Professorship in Wheat Breeding in the Department of Plant Agriculture at the University of Guelph. The announcement, and official signing of the contract, was held at the University of Guelph this morning. “This position was created to address the acute need for cereal breeding, especially winter wheat breeding, in Ontario,” explained Henry Van Ankum, Chair of Grain Farmers of Ontario, at today’s event. Since 2010, Eastern Canada has lost through retirement all four permanent public wheat breeders who were conducting research in the province, two of whom were dedicated to winter wheat and whose research was critical to the establishment of winter wheat as a key crop in the province. The new professor will focus the majority of their time on wheat breeding and also participate in the Ontario Cereal Crop Committee, which acts as a recommending body for cereal registration and coordinates cereal performance testing. He or she will also work to address key priorities for wheat producers, such as disease tolerance and resilience to factors like variable and extreme weather. 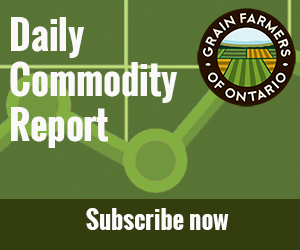 It’s expected that the position will be filled in 2014 and Grain Farmers of Ontario looks forward to working closely with the selected candidate. As “Canada’s Seed Partner”, SeCan actively seeks partnerships that promote success in Canadian agriculture. SeCan is the largest supplier of certified seed to Canadian farmers with more than 700 member companies from coast to coast engaged in seed production, processing and marketing. Since its inception in 1976, SeCan has been a major supporter of plant breeding in Canada, returning more than $77 million in royalties and research funding. SeCan represents more than 450 varieties in 27 crop types – developed by public and private sector breeding programs.